At the event, over 500 students from To Hoang Secondary School and Quan Hoa Primary School were provided with information about the road traffic regulations. 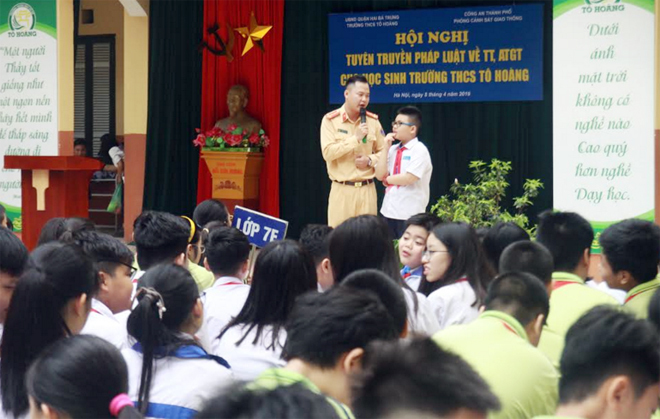 In particular, police officers and soldiers of the Hanoi Traffic Police helped students identify traffic signs and learn traffic safety regulations through funny and understandable quizzes and images. Thanks to plentiful contents, vivid images and attractive presentation, Senior Lieutenant Hoang Viet Duc, speaker from the Traffic Police Division under the Hanoi Municipal Police Department attracted the students’ attention to the training, helping them understand better about the legal regulations on traffic safety. Ms. Hoang Thi Thanh, Vice Headmaster of To Hoang Secondary School shared that it was a very meaningful program. The traffic police officers with their in-depth knowledge, authentic images and interesting presentation really benefited the students and raised their awareness of the observance of the traffic regulations as well as of wearing helmets when riding motorbikes. According to Captain Dao Viet Long, Deputy Head of the Hanoi Traffic Police Division, the unit will continue to coordinate with other schools to hold more training programs on traffic safety regulations.